Ford, for 10 million reasons, spared the iconic Mustang when the company’s decision-makers said recently they’ll soon end production of all their other sedans, in favor of trucks and SUVs. Ten million Mustangs have rolled off the Ford assembly lines since 1964, first at the Dearborn, Mich., assembly plant and most recently at the Flat Rock plant. It’s been a long string of successes for the Mustang, which today outsells its pony cars competitors, the Chevy Camaro and Dodge Challenger. The Mustang 390GT was featured in the 1968 movie, “Bullitt,” starring Steve McQueen; the ram air “Shaker” hood scoop became available for any Mustang with a 351-cid or larger V-8 in 1970; the Mustang II was introduced in 1974, 500 pounds lighter and 19 inches shorter than previous models; the Mustang convertible returned in 1983 after being absent for 10 years; a driver’s-side airbag became standard for all Mustangs in 1990; a commemorative Bullitt GT joined the lineup in 2001, inspired by the 1968 model featured in the movie; 2004 was the last year Mustangs were built at Dearborn, where all models had been produced; production on ’05 models was moved to Flat Rock; the Shelby GT500 was launched in 2013, with supercharged 5.8-liter V-8 and 662 horsepower, the most powerful V-8 in the world at that time. What’s your all-time favorite Mustang? 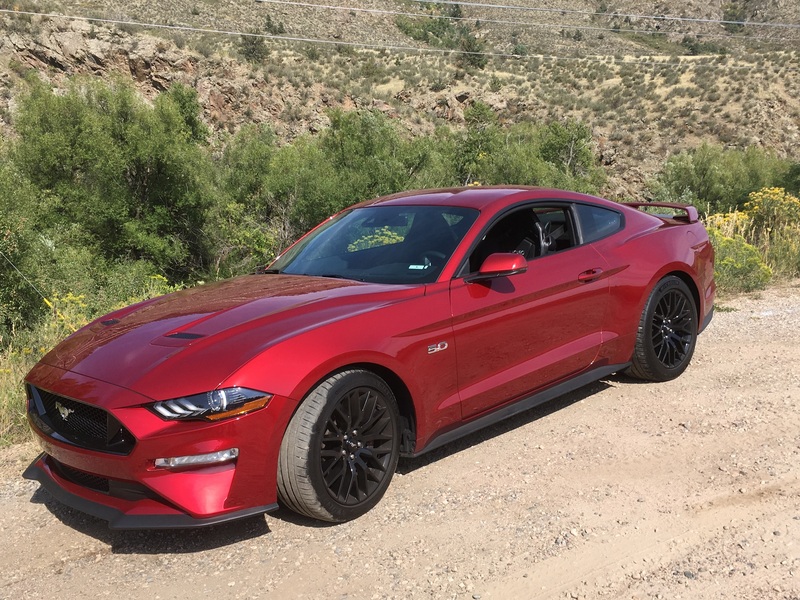 The one I gave up after seven days – the 2018 Mustang GT Coupe Premium with 460-horsepower, 5.0-liter V-8 engine, 6-speed manual transmission and ruby red color – is one of my favorites. Performance is as good as you’d expect from all those horses, and the beat from the quad-tipped dual exhausts will uphold the smile of your face. Settle into the Recaro sport seats with the bolstered side grips (it has no power seat), depress the clutch and brake, hit the starter button, take hold of the traditional shifter knob, shift to 1st and move out. Ford says the Mustang, with the optional 10-speed automatic transmission and placed in “drag mode,” will run 0 to 60 in under 4 seconds. The one I drove, with the manual shift, “slows down” to 4.1 or 4.2 seconds. Most of my driving was in Normal or Sport modes, occasionally Track. Steering modes were also offered in Normal, Comfort and Sport; the steering feel tightened considerably in Sport, much more crisp. Grip and handling were excellent, with Michelin Pilot Sport performance tires, 19-inchers. The Mustang averaged 18.4 miles per gallon (EPA estimate 15-25), including a drive on U.S. 34 to Masonville, then a mountainous tour of twists and climbs in Rist Canyon to Fort Collins. Sharing the roadway were lots of bicyclists and even a herd of cattle out of its fences. The rear-drive Mustang, with its handling and power wealth, was right at home in the hilly area. Sticker price on the Mustang GT has soared to $53,160, including $3,995 for a performance package of bigger Brembo brakes and heavier-duty suspension system. Among interesting features of the Ford were a digital readout of rpm in the middle of the tachometer gauge and the image of a horse as puddle lamps on both sides of the car. The subwoofer for a Shaker audio system steals space in the trunk, which measures 13.5 cubic feet.